Corwith Vineyards, in Watermill on the South Fork of Long Island, is a very new wine operation that was started with idea that it would be run as a sustainable operation from the beginning, and it became the first vineyard to begin operation as an already-certified member of the Long Island Sustainable Winegrowing organization. 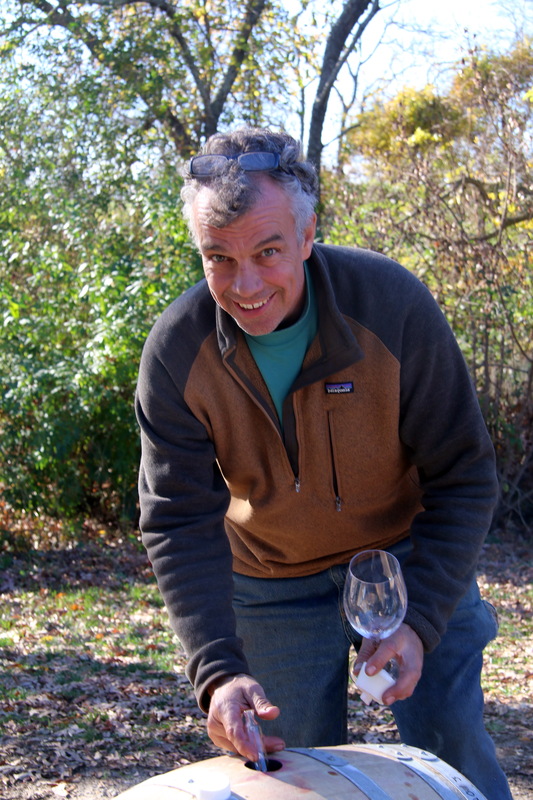 Dave started with a first planting of 300 vines on about half an acre three years ago. So far, he says, they’re doing well, promising to provide a small yield at this point. He deliberately began with varieties that are a bit easier to grow and have earlier seasons: Austrian varieties such as Lemberger, Blaufränkisch, and 100 vines of Dornfelder, a pretty popular red variety: it produces a light red wine, and the vine is very vigorous. Dornfelder was planted at Channing Daughters, where it does very well, and Dave says there’s also some on the North Fork, and that they’re pleased with it there too. Though these are hardly run-of-the-mill varieties, so far only Channing Daughters has planted them in Long Island, along with a number of other German and Italian vines rarely seen in other vineyards in New York. However, over the years the viability of these varieties has been proven by Channing, and the popularity of the varietals made from them is proof enough. “I’m about, I don’t know, three or four miles [west] from Channing Daughters. Channing Daughters probably [has] about the closest profile to what mine is as far as weather conditions, microclimates, etcetera. They’ve got thirty acres of good grapes over there and they really do the later varieties I was advised to stay away from, such as Cab Sauvignon and the fluffy Pinot Noir. So I’m not taking those on. You can grow Cab Sauv on the South Shore, but it’s going to be a little bit on the green side when it comes up and it will make a rosé, but you’re not going to make a first quality Cab Sauv that you can put away for a while. You will one in ten seasons, okay? But those other nine seasons you’re going to be making rosé, which is okay . . . . I chose not to go after the later [ripening] varieties, at least not until I get to know everything. “I have two acres [planted] now. Lemberger, Dornfelder, those are two reds. Grüner Veltliner (‘green velvet’ in German). One Woman Vineyards has it on the North Shore. [Claudia Purita and her daughter] Gabrielle are the only ones I know of that have it. I was just over there last weekend and we got a couple of bottles. So I put in 300 plants of the variety . . . . There is more information about Arandell and Aromella in Cornell’s Issue 13, March 2013, of the Viticulture and Enology Newsletter. They’re referred to as the 55th and 56th grape varieties named by the Agriculture Experiments Station in Geneva run by Cornell. Dave’s information was particularly interesting, even newsworthy, because hybrid varieties have barely made a dent in LI viniculture, except for at Pindar. This is probably the first time that a new hybrid, Arandell, has been introduced to the LI wine region in years. Furthermore, Dave is one of the early adopters of Arandell and unique in planting a hybrid variety in Long Island when hybrids have mostly been eschewed entirely by other growers. Dave went on to say: “I have 300 plants [of Arandell] this year. I’m very pleased with the growth and the disease resistance. It’s noticeably better disease resistant, and I’m just an amateur at this, and I can tell. Huge difference. So from a sustainable standpoint, . 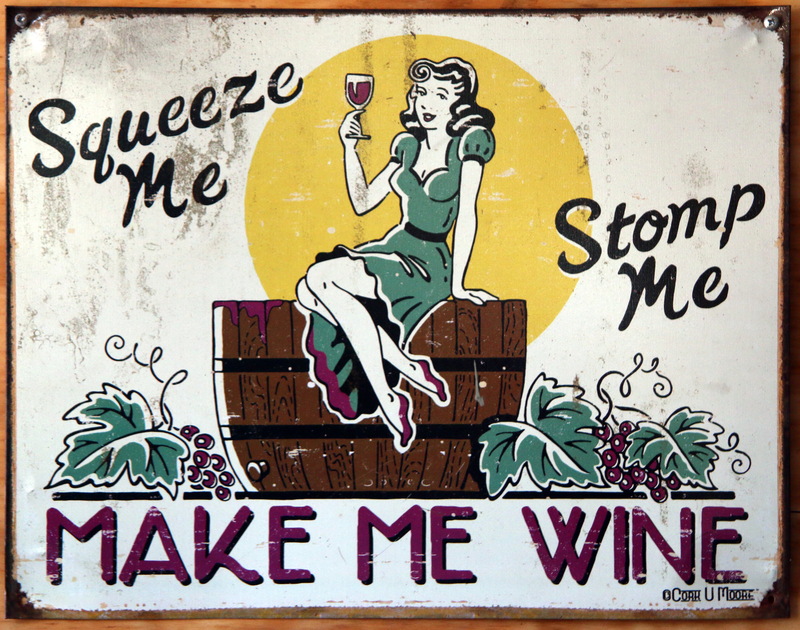 . . I’m very much involved with Long Island Sustainable Wine Council. Everyone [else who joined was already] established. I’m . . . the first guy to kind of take the Long Island Sustainable program from scratch. So one of the things that we don’t really talk too much about because everybody’s got theirs planted already is new planting. A good approach is to put in a disease-resistant variety that still makes a good wine. Those are hard to come by. This is where I’m sort of hedging my bet a little bit with the Arandell. “What I’m learning in my research is that when you go either upstate, mid-west, Minnesota, and you get into these slightly colder climates, they really look hard at the cold hardiness of a specific variety as one of their key things that they have to pay attention to. We are not so much that way. We don’t pull up our grapes here on Long Island. It’s mild enough … I don’t even really worry about that at all when I’m trying to decide on a variety. But they have to. Vinifera, the European grapes, don’t do so well with the colder climates. I replied that while his remark about vinifera varieties is largely true, there is considerable success in the Finger Lakes with Cabernet Franc, Pinot Noir and, of course, Riesling, which is most definitely a cool-climate grape. To which Dave said: “Right. So they made it work. They figured out how to make it work up there and I applaud them for being able to do that. Down here, on Long Island, I’ve had people tell me, ‘You can pretty much grow any variety you want.’ I’m sort of taking that advice, but carefully. I pointed out that it’s absolutely astonishing how many varieties there are growing on Long Island. In a database about Long Island vineyards that I maintain I have listed so far thirty-seven: twenty whites and seventeen reds; add Arandell into the mix and that would make it eighteen red varieties. At this point I asked him if he was growing grapes with the intention of selling them to other producers or have them made for you by another winery or a crush facility like Premier Wine. I told Dave that it struck me that he was another garagiste, like Le Pin, the great, small winery in Pomerol. He must be farming other crops in the meantime to derive some cash flow. JM-L: Well, you know, Rex Farr, of course. DC: I know Rex. Yep. He’s taking the organic approach. He’s the only game in town, I think, [though] Barbara [Shinn’s] pretty close. JM-L: Barbara’s close, but not quite there. Rex, of course, has been farming other crops organically for years. I think he only started growing grapes in 2005. The fruit is excellent from what I understand and this other startup in the North Fork, Southold Farm and Cellar, is buying its fruit from Rex Farr. DC: Where my farm is there’s a forty-acre parcel that I share. I can expand if necessary, and I have farmland on another piece that I can work with. That’s not as good for potatoes; it would be better for grapes. So I got to look at that, but it’s presenting some challenges when I split the operation a mile away and you’ve got to have the earth cracks, you’ve got to have water, and you have to be able to get over there. When I retire from my full-time job and this becomes my full-time job, down the road, I’ll put in five or ten acres over there of something else I really like. JM-L: Of course. So tell me something. 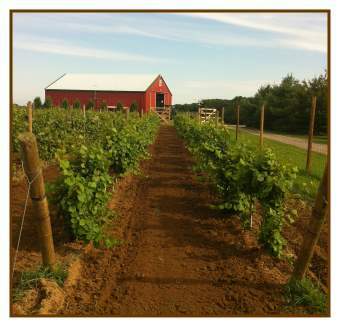 To whom did you turn for advice on how to prepare your fields and plant your vines? DC: Okay. A couple of things. I started with learning extensively about organic farming in general via dynamic approach, as well as the Soil Foodweb approach, which is Dr. Elaine Ingham. Look her up or Google Soil Foodweb. She’s the mother of compost teas. So I’ve been working a lot with compost teas the last several years for all of my crops. Not just the grapes. I’ve had good results with it, but it’s something I would really like to see more testing done with. Compost teas are really good … They’re, basically if you take compost and you mix it with water and you mix it all up and you bubble it or you fish bubble it for 24 hours, you can culture the bacteria, fungi, protozoa, nematodes. Then once you culture that and you grow those, remember from your science class bacteria splits every four hours, so same thing. If you can grow the fungi and the bacteria, that’s really what we’re after. Then you spray that on the plants as a foliar spray. The theory is you will push out [the good] from the bad guys. If you cover the leaf with beneficial bacteria and fungi, when the bad guys try to show up to eat the leaf, they get kicked out. JM-L: So this is Biodynamics? DC: Well, it’s a cousin to Biodynamics, [which] is taking compost, particularly what they call barrel compost, that’s been buried in the ground over the winter, put it in cow horns and it’s a dairy-based, or cow-based, manure compost, which is excellent. Then they spray that on. With compost tea, you take, particularly, a fungal dominated compost that you have made from a real thick compost pile. So you have to make compost correctly. You can’t just make dirt. You get a good quality compost, particularly one that has worm cavities in it, which is about as good as it gets, and then you put that in a teabag and you boil it … Well, you don’t boil it. You just bubble it in a barrel of water for 24 hours and you can take that and spray it out around your plants as a foliar nutrient spray, if you will. So I’ve been working with that, and that’s very, very similar to what the Biodynamics people are doing. Biodynamics takes it to the next level and they add a celestial component to it. What’s the phase of the moon when we’re doing all this? JM-L: Well, this, of course, is where Biodynamics becomes controversial. DC: I guess when people are . . . . When I try to explain Biodynamics to people, the simplest way, as I said, ‘Well, does the full moon change the tides on the Earth,’ and most of us know the answer is yes. Sure. It changes the high tide, low tide effect. So if the moon can change the high and low tides, why can’t the moon change the effect of way the plant is growing on a full or new moon. Then add that in and now Biodynamics goes five levels more than that, you know? Get in all the planets as well. That’s where it gets, like you said, controversial. So I started with biodynamic and compost teas, learning how to work with those . . . . when it came time to look at grapes, I went over to talk to Alice Wise, kind of got to feel her out, and I went over and talked to Steve Mudd who’s put in probably half the grapes on the north shore. Talked to Steve about things and he was very helpful. Then I sort of got involved with the Long Island Sustainable program last year, and that’s been a tremendous benefit for me, a new guy learning how all this stuff works because they’re really promoting the educational side. Some of the speakers they brought [in] are really, really good. The workbook that we use is excellent. It’s based on the Vine Balance Workbook, which is excellent with regard to how we’re farming it and … It looks at the big picture, which is good. JM-L: Actually, what’s interesting is that when the Vine Balance program was first developed by Cornell up in Geneva. They developed it for use statewide but they never took into consideration the proliferation of Vinifera grapes and, of course, at the time that they first came out with Vine Balance, there were no grapes being grown on Long Island. They had to modify it for the Long Island growers. JM-L: That’s fabulous. Now what, by the way, is your vine spacing? DC: I’m using nine by four and a half to five; nine feet on the rows and then five on the plants, four and a half to five. The first group I put in, I actually put them in about eight by three but that was too tight. It was too close. JM-L: Okay. Are you using machinery in the rows? DC: I use a mechanical weeder. I don’t use any herbicides. José, one of the things that came about with the Soil Foodweb model … I’m going to back up just a little bit here. The Soil Foodweb model talks about the fungi in the soil. It’s really … Dr. Ingham, for 30 years, she studied, “Well, what does the plant look like underground? What’s going on in the root system of the plant?” That’s what she studied. Okay? One of the things that she talks a lot about is what’s called mycorrhizal fungi. It’s a type of fungi that … I don’t know if you’re familiar or not, but I’ll give it to you. It’s root extensions. If you add extensions on the spiderweb of fungi that go out and get the nutrients for the plant. Dr. Ingham talks about this fungi going down, not feet, but higher than feet, they can connect. You can have fungi in the soil that can connect for even up to miles, distances. So it’s this fascinating web of fungi underground. With herbicides we kill the mycorrhizal fungi, so when I put my plants in, I gave them a shot of mycorrhizal fungi in with the soil mantis that I was using with the roots. I gave them a shot of that. Now they say you get another 20/25 percent growth if you put in mycorrhizal fungi. I talked to Larry [Perrine of Channing Daughters] a little bit about it. Richie Pisacano over at Wölffer’s has been very helpful too. JM-L: Rich is fabulous. Rich is called the Grape Whisperer, you know? DC: I talked to him about Pinot Noir the other day. I said, “Richie, can I grow Pinot Noir here?” and he goes, “It’s a tough grape to grow.” It’s really tough. Although I talked to a guy that I order my grapes from upstate, and he has a clone that he said would work for me, what I’m trying to do. Pinot Noir 19, I think it is. That’s not what Ritchie’s got over at Wölffer. They put in Pinot 20 years ago and they make a rosé out of it, or they make a champagne out of it. They don’t make a [red wine]. I got a couple of out-of-the-box ideas for you for varieties that I’m sort of researching. I’ve got mixed emotions about all of them. Cabernet Sauvignon can’t do it. What about its sister grape? There’s Cabernet Dorsa, which is a cross of Cab Sauvignon and Dornfelder, earlier, that you can’t plant. You’ve got Franc, which is its own variety. Then there’s another one, Cabernet Mitos, which is a cross of Cab Sauvignon and Lemberger. These are varieties that I’m growing now, so I thought, ‘Well, okay. Maybe that’s how I can bring a Cabernet into the picture.’ Cabernet Mitos, I wasn’t able to find it . . . . I haven’t even tried it yet. There’s only 750 hectares worldwide, and it’s all in Germany. It’s a German-developed variety, so I’ve got to see what it can do. I’m looking at those and then the other ones that I think Chris and Larry are doing is Tempranillo, [which] is a sister to Grenache. Yes, and Grenache, they think, was originated in Sardinia and they called it Cannonau. At least that’s what they say, but it’s only grown in Sardinia. And a sister to that is Tempranillo. I think Tempranillo would be a cool grape to try to grow around here. A good blender, you know what I mean? Also, Albariño. JM-L: Albariño! Well, you know, there are two people who are growing Albariño now. One is Miguel Martin at Palmer and Rich Olsen-Harbich has planted some at Bedell. DC: I put in 200 plants; that’s an experiment too. I got mine from upstate, The Grapevine, which is up by Geneva. They, I’m almost sure, grafted it for me. They put it on 3309 and Sl4 [rootstocks]. JM-L: Miguel has been making a splendid Albariño himself. You should try it if you haven’t. DC: Yeah. I have. I’ve been over there. Miguel helped us make our Chardonnay this year. He is . . . terrific. Good people. You know, I want to say something, José. I kind of got into the grape thing, predominant over on the North Shore, but as I get to know people over these last three or four years, what I’ve discovered is it’s a small fraternity of wonderful people that all want to help each other out, and a rising tide lifts all boats. So I haven’t found anyone who has not been willing to help as I, have gone along the way. They’ve been very, very nice. JM-L: Well, Dave, thank you very much. I think we’ve had a very interesting and instructive interview. What you’re doing is exciting, and I want to continue to follow your progress. This interview took place on May 20, 2014; a visit followed on November 17, 2015. 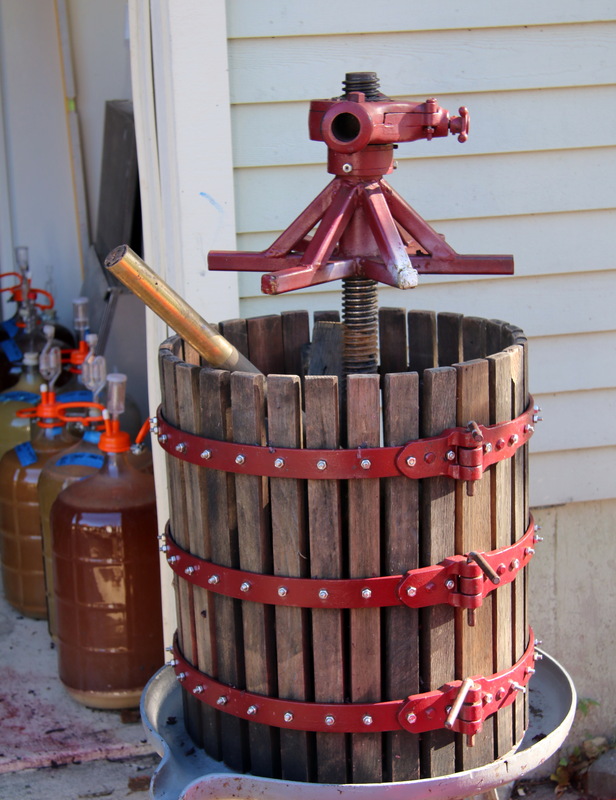 The basket wine press was purchased used and needed extensive repairs, which were done by Dave’s father. 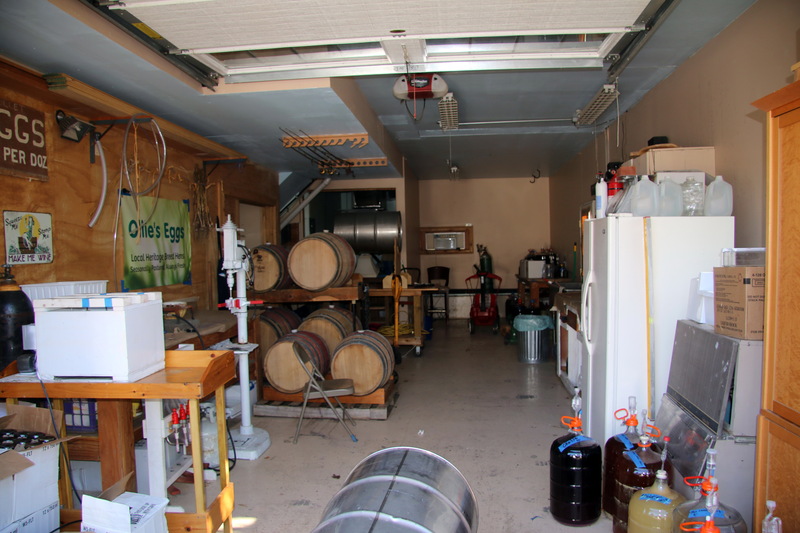 It is very small–it has barely 50 gallons capacity–and not at all efficient, but it adequate for the small batches of wine that he’s currently producing. This is a far cry from the much more advanced pneumatic presses that are used in most of the LI wineries, which have much larger capacity and press fruit with greater precision and control. This is a handmade crusher-destemmer, again of very small capacity, so it requires considerable patience to work with it, but it works just as well as the much larger industrial versions and, after all, it is only being used for very small batches of fruit. 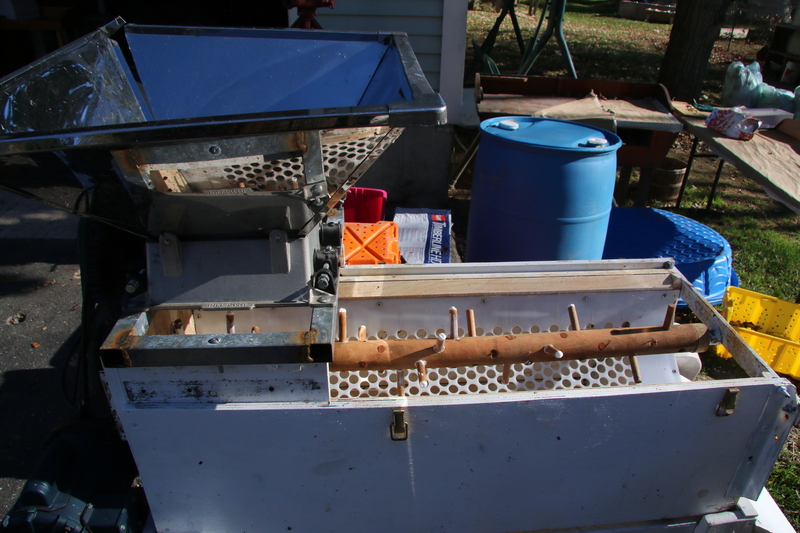 The crusher is at the upper left, and the fruit then drops into the perforated basket below, where the rotating wooden destemmer (with plastic tips removed from the posts) separates the stems, which are pushed out of the basket and fall on the ground while the crushed grapes pour through the perforations into a trough that flows the juice into a bin. The must to be fermented is then placed in a metal or oak barrel, which in Corwith’s case are small and few in number. 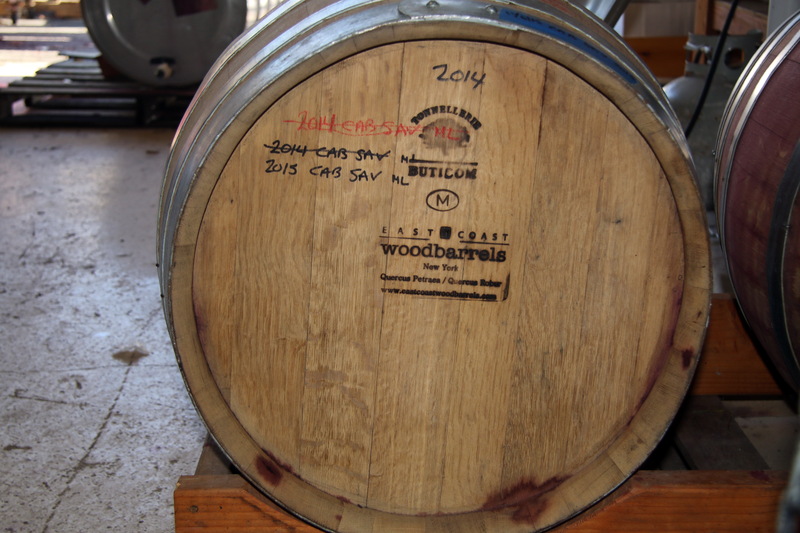 Dave buys his oak barrels from a cooperage, East Coast Wine Barrels in Medford, a Long Island town.Their barrels are meticulously made from Romanian oak. Dave has them medium-toasted to somewhat abate the oakiness that could be imparted to the wine. When the wine is ready to be bottled, the bottles themselves first need to be properly sterilized by a dose of sulfur gas followed by a whiff of nitrogen to expel the sulfur so that it will not add flavor to the wine. This is an entirely handmade device which has perforated wood bars allowing up to 12 bottles at a time to be treated. Beneath the inverted bottle necks are nozzles that inject the gases into the bottles. 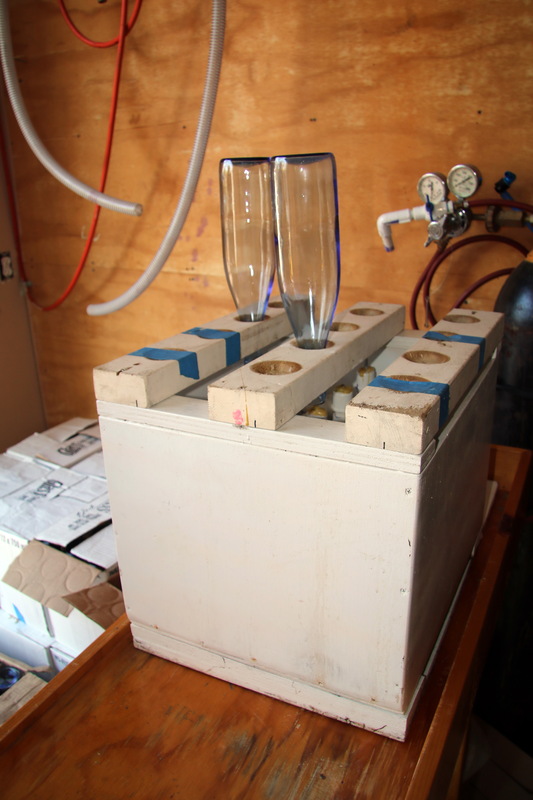 Rough-hewn as it is, it works perfectly well, even if it’s no match for industrial sterilizers that can handle far more bottles at a time with much less manual labor per bottle. The final stage, of course, is filling the bottles with wine. Yet another hand-crafted gizmo is brought to bear on this all-important function. In this case only four bottles at a time can be filled, but it goes fairly quickly, especially if there are only small batches of wine. However, each label has to be affixed to each bottle by hand and for now the contents are written by hand as well. 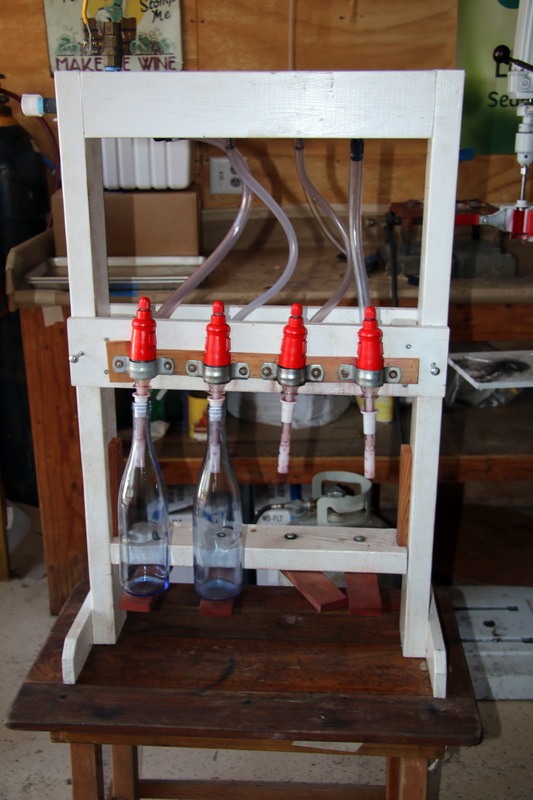 A completely automated device to do everything from filling the bottles to inserting the corks and adding the neck capsule, and finally applying the pre-printed labels costs many thousands of dollars and Corwith may never be able to afford one, but a larger rig like the one in the picture would certainly be called for once Corwith goes into commercial production. Of course a barrel-tasting was in order, and Dave very happily obliged. The first wine was a “poor man’s” Bordeaux-style blend made of equal parts Merlot, Cabernet Franc, and Cab Sauvignon 2014 from North Fork vineyards, aged in Romanian oak. It will continue aging in barrel for some more months, but it already is showing promise, with good fruit, lively acidity, and form tannins. A Chardonnay from Lenz Vineyards fruit of 2015 is just weeks in stainless steel but the wine is from good, clean fruit and also shows good promise. Also in steel is a Grüner Veltliner from 2015 grapes of Corwith’s own vineyards. Promising as well, but still too young to say much more. An Arandell wine comes across as a tad foxy, but then it is a Cornell hybrid. Dave plans to treat it like a Syrah or Petit Verdot but it will certainly have to be blended with a red vinifera to bring the foxiness under control. All of this is the achievement of a “newbie garagiste.” Not bad, not at all bad. Please note that at this time Corwith Vineyards is not open to visitors and its website is new and under development. This entry was posted in Vineyards, Vinification, Viticulture and tagged Arandell, Aromella, Channing Daughters Winery, Corwith Vineyards, Dave Corwith, East Coast Wine Barrels, Long Island AVA, Long Island Vineyards, Miguel Martin, South Fork AVA on 19 November 2015 by JoseM-L.